When I was a kid, one of the boxed sets of games that my family picked up for me was the Zork Anthology, a 1994 collection of the what someone at Activision considered the “Zork” games. This package included the original Zork trilogy, Zork Zero, Beyond Zork, and… surprisingly… Planetfall. Looking back on this now, it’s clear not a ton of thought was put into this: the set didn’t include either the Enchanter series nor the ZorkQuest games. 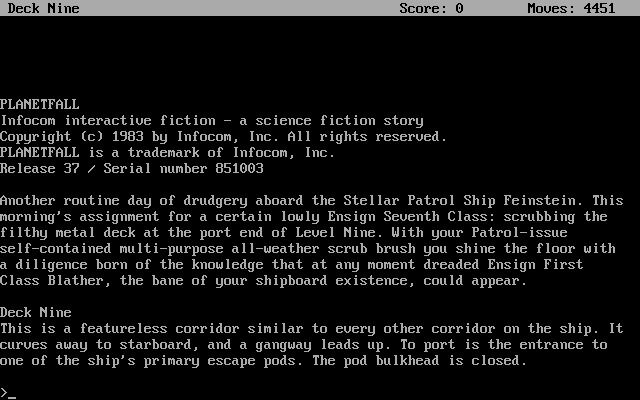 They probably didn’t intend to imply that that Planetfall existed within the Zork universe, but it was enough to lodge this particular misapprehension firmly in my brain for decades. When the time came for my marathon here, I added Planetfall to the list even though I knew better. Who knows? It might be connected after all. Last time out, I took a break from my marathon to play Suspended, a dystopian science-fiction game and Infocom’s sixth title. 1983 marked a huge year for Infocom, a company that had never released more than two games per year suddenly had five. After Suspended came The Witness, a game that Ilmari reviewed last year, and then Planetfall. Although Ilmari already looked at The Witness, I wanted to come to Planetfall with the full Infocom experience so I also played and then wrote about my experiences with that game. You can find it as a special bonus post here. Spoiler: I do not like it as much as Ilmari did. 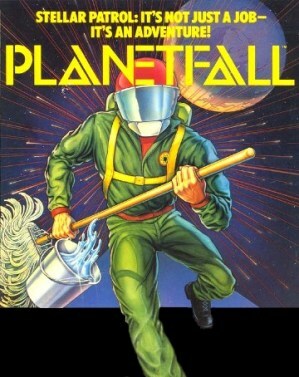 Planetfall is the first game by adventure gaming legend Steve Meretzky. We’ve seen his work (in various roles) on the Spellcasting series and Gateway; we’ll also be seeing him soon in Leather Goddesses and Rex Nebular, not to mention at least three more stops on the Zork marathon. He came to Infocom as a game tester and, thanks in large part to Planetfall, became one of their top designers. I’m thrilled to be able to experience his first game once again. For the first Infocom game in forever, this game doesn’t seem to require you to memorize the manual before you play. 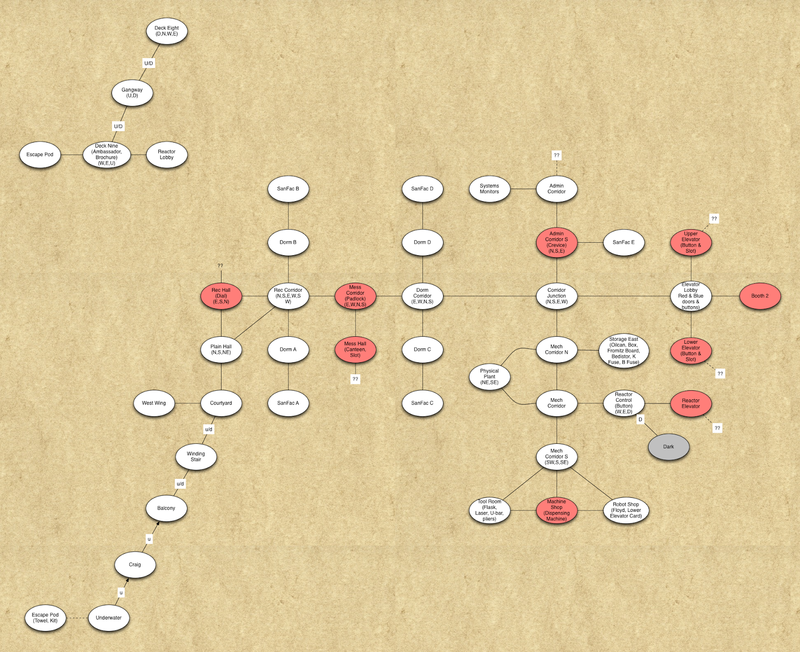 Each of the mystery games, Suspended, and Starcross all had their own custom vocabularies and one-off commands that you had to know to get to the end of their adventures. Planetfall seems to have none of that, at least nothing that stands out as being essential. 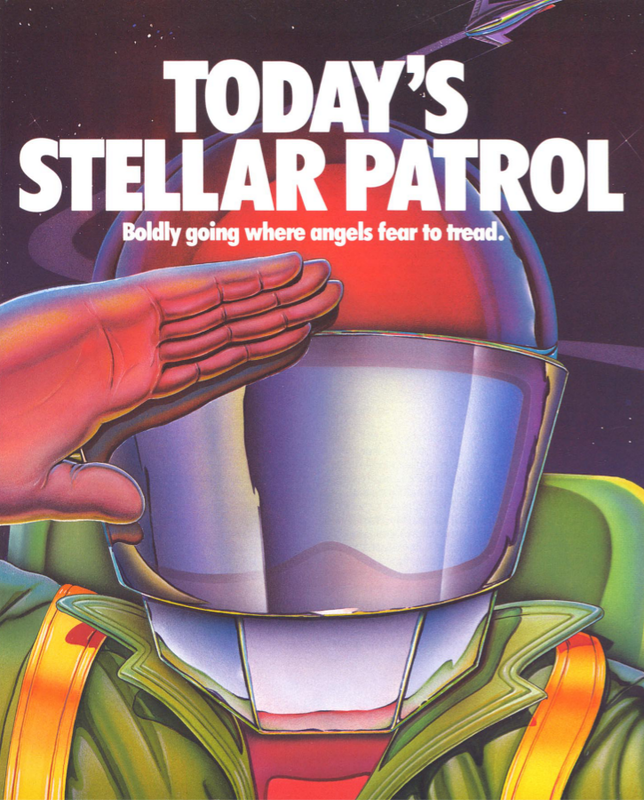 We have the normal introduction to text adventuring, backstory about the history and mission of the Stellar Patrol, and the personal diary of our hero. The latter is the most interesting as it is the first time we’ve had a fully fleshed out character that we inhabit in one of these games rather than a thin veneer on our personal avatar. This ensign that we will play as has a family, goals, and a poor relationship with his sadistic boss, Ensign Blather. This is even more noteworthy because it’s the first of the “Zork” games that we have played so far to have this material included in its original release. Starcross, for example, will get its journal text with its “grey box” re-release in 1984. I’ll backtrack to look at all of that new material at some point. The setting is in the distant future. Mankind has been traveling the stars for more than 10,000 years and has settled into a vaguely Star Trek-style system called the “Stellar Patrol”. Patrol members are expected to be able to speak 18 languages but thanks to advances in teaching and electric shock therapy, the brochure says you can learn them all in three days! I am also amused to discover that the future also has the “Deep Space Hero Correspondence Course” for patrol members, perhaps a tiny glimmer of that idea was reused for the Coles’ Hero’s Quest game released six years later. I could go into it more, but it’s hard to write about humor in an interesting way. You can find the manual in the Lost Treasures of Infocom mobile app, available in an app store near you, or just by Googling for thirty seconds. I’ll wait. All set? Let’s play! Before we begin, the standard disclaimer: I am positive I played this before but I doubt I got very far. 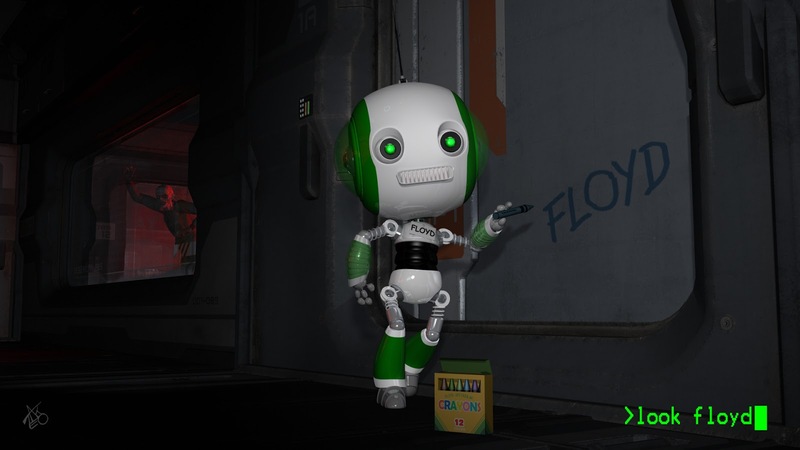 I remember an adorable robot named Floyd and his comments when you save that you “must be doing something dangerous”. I know, but probably didn’t experience firsthand, that Syblq qvrf ng fbzr cbvag bayl gb or erfheerpgrq, Frnepu sbe Fcbpx-fglyr, sbe gur frdhry. After that, my mind is a blank but I may remember more as I play. We just started and are already at 4451 moves! We start the game on “Deck Nine” of our starship. We’re in low-circumstances, a space-janitor who is forced to clean floors and be tortured by his space-manager. I start in a room with an escape pod but there is no escape for me as the pod bay doors are closed. I start to poke around the ship but am immediately stopped by Ensign Blather who gives me demerits for being away from my post and forces me to return to cleaning duty. I clean the floor but even that isn’t enough because Blather comes by to tell me that I’m doing an awful job. You know what? Screw him. I head off in a different direction to explore and make it all the way to “Deck Eight” before he catches me and throws me into the brig. Unfortunately, when the ship blows up a few turns later, I am nowhere near the escape pod and so I die. Time to try this again. On the next attempt, I play nice and scrub the floor. Scrub, scrub, scrub, turn after turn. At one point an alien ambassador stops by and drops off a brochure that contains the game’s credits. Blather still isn’t happy even though I’ve spent nearly every turn so far typing “clean floor” over and over again. But when the inevitable emergency happens, I am standing right outside the escape pod when it opens. I run in and wrap myself in its protective webbing-- I remember what happened in Starcross when I wasn’t properly strapped in! I’m the only person that made it to this pod-- did a comedy game just start with the fiery deaths of hundreds of characters just offscreen? I hope not! I wait a while as the pod identifies and travels to a nearby planet. It’s almost completely covered by water so the pod takes us down to a region with two islands. The craft eventually comes to rest on one of the cliffs but it’s not a good perch and the pod falls into the water. I scramble out-- picking up an emergency kit and a towel that appear from a bulkhead-- and swim to the surface. The western half of the complex is the oldest part with a traditional “castle” look giving way to a modern military barracks. In addition to the useless-seeming dorms, I also find three areas which are blocked off: a combination-locked door in the recreation room, a padlocked door in a nearby hall, and an access card-locked door leading to the kitchen. That area is separated from an eastern building by way of a broken moving walkway between “Dorm Corridor” and “Corridor Junction”. It’s not long in any practical sense, but the game tells you that it is long and multiple moves pass when you cross it. If there’s a time limit here, I may have to avoid running up and down that section too many times before I figure out how to repair the walkway (if I can). One observation: the “moves” counter in the game is quite different than in previous games. All actions seem to take different amounts of time with moving between rooms incrementing the counter by between 10-30 units, that specific hallway jumping it by 60, and dropping and retrieving items taking 5-7 units. There is probably a rhyme or reason but I’m not going to pay much attention to it yet. If I need to map the whole game for how many units of time it takes to go through each exit before having to come up with a least-cost model… I’ll be disappointed. Let’s hope it doesn’t come to that! An administrative hallway that is cut in two by a large crevasse apparently caused by a long-ago earthquake. There’s a monitoring room that I can get to that tells me that the library, reactor, and life support are all functioning normally but that planetary defense, course control (? ), communications, and project control (?) are all malfunctioning. It’s all in the mangled gibberish so it is a bit difficult to know if I read those labels correctly. In a separate part of that hallway, there’s a key hidden in a crack in the floor but my fingers are too plump to retrieve it. A “Mech Corridor” which contains a storage room of spare parts (oil, fuses, and some technobabble items), another tool room of spare parts (flask, laser, u-bar, and pliers), plus a machine that dispenses different flavors of acid. The mech corridor also has both an elevator and a stairway to access the reactor. The stairs are dark (with grues!) and the elevator requires an access key so I’ll have to find a way in there later. A separate elevator bank with both “upper” and “lower” elevators and a “teleportaashun buux”. All three require access cards that I do not have. Isn’t the garbled text great? A final item deserves a deeper mention: it’s Floyd! Yes, I found the expected robot friend turned off in a room at the end of the mech corridor. I search him before I activate him and find the access card for the lower elevator. Once I turn him on, he’s as bouncy and entertaining and annoying as I remember! Just in some quick experimentation, he doesn’t really listen to anything you say unlike the robot in Zork II, he can’t travel anywhere like the robots of Suspended, and he’s just as likely to drop anything I hand him as keep it. If he’s not going to be used for puzzles or storage, what can I use him for? His little quips are childish and entertaining and maybe I’ll write more on that later. Unfortunately, my DOS emulator doesn’t do cut-and-paste so I can’t easily copy loads of Floyd-isms here. To steal a phrase from Hitchhiker’s Guide, he has a “genuine people personality” but that personality is endearingly childlike. While researching this post, I found an absolutely amazing artist on DeviantArt who has produced 3D illustrations of Planetfall scenes. I hope you go and check out his work although there may be spoilers hidden in there. I didn’t look too closely outside of the first couple of images. You can find his page here. I’ve also found a few images of what may be Floyd from a cancelled graphical Planetfall sequel and I’ll provide those next week if I can find them in reasonable quality. While all this is going on, I hit another aspect of this game: hunger and exhaustion. It seems that time is passing for real here and I have to eat one of my rations (a red goo that tastes like cherry pie!) out of my survival kit. I have two rations left so I hope I’ll be able to find more, unless this is the time limit. A bit later, I’m told that I need to find a place to sleep. Remembering all of those comfortable dorm beds, I head back to that side of the base with Floyd and plop myself in the nearest bed. I quickly fall asleep and wake up to Floyd beaming over me. It’s now Setem 7, 11344. Time for a new day! I’m going to go use the lower elevator access key and see where that gets me. Inventory: ID card, survival kit (with green and brown goo remaining), towel, brochure, scrub brush, uniform, chronometer, canteen, and lower elevator access card. If you haven’t checked it out already, you can find my bonus post on The Witness here. Don’t forget that this is an introduction post, the right time for you to place your score and “what will Joe get stuck on” bets. Since I’m the helpful sort, I will remind you of the scores of the marathon games so far: Dungeon scored 41, Zork I scored 35, Zork II scored 32 points, Zork III scored 42, and Starcross scored 37. We’ve also evaluated a number of Mr. Meretzky’s other games and he’s managed 48 and 51 on the two Spellcasting games we’ve played so far and a stunning 65 points for Gateway. He is officially listed as just a game tester for the latter but there are rumors (perhaps just by Meretzky fans) that he had a larger role. One final note: do we have any Japanese readers that would be interested in doing a guest post on the Japanese semi-graphical Infocom games that were released around 1992? I believe that Zork I, Planetfall, and Enchanter all received graphical updates to some extent but I have had difficulty tracking down specific information or screenshots. Which I will round to 44. "I believe that Zork I, Planetfall, and Enchanter all received graphical updates to some extent"
Planetfall really does labour beneath the shadow of the HHGTTG. Also a notable moment in the brief "janitor/hero" zeitgeist. I know very little about Moonmist except it isn't on my list, but I wonder now what brings it up to the level of those luminary titles? Maybe I should play it now to see? As for Hitchhiker's Guide, I played that when I was a kid and more of that has stuck with me than many other games (the "no tea" and neuron maze being two things I recall). Maybe I'll get to play it soon, maybe not. Moonmist does a few interesting things, but is nobody's favorite Infocom game -- no one can adequately explain why it was one Systemsoft chose to adapt. Of course Planetfall predates the HHG text adventure, but even in your review there are plenty of HHG touches noted -- the towel, the "genuine people personality". I think that at this point, going for the comic SF tone, channelling a little Douglas Adams was inevitable. When that titanic Infocom game does get covered, someone should do a play-along with the AGS graphical remake. Infocom's HHG game was their biggest non-Zork hit. Covering Seastalker but not it doesn't make a lick of sense. Of course, we have until forever to fill this blog with reviews, so I'm satisfied that in the fullness of time, you will find a spare month to squeeze it in, even if it's out of the sequence you've decided to follow. I'm positive one of us will play it soon, I'm just crazy OCD about doing things in order... I'll bookmark your page and read it once I play it again. Personally, I'd be far more interested to see what you think about A Mind Forever Voyaging or Trinity than HHGTTG. Part of my issue is that I only know some games by reputation. I simply don't know which ones are the "best" and I more or less would rather not know before I start so I don't come in with too many preconceptions. Infidel does have the surprise ending, so it might merit some consideration. Of those I've played: HHG and Trinity are must plays. Infidel is worthy of discussion and analysis. Seastalker is forgettable. Of the others, I understand AMFV is worth experiencing for its unique approach. Cutthroats is, I gather, in a similar vein as Seastalker. Joe: Considering making this a general Infocom marathon. You have been surprisingly efficient in getting through these games, so it doesn't seem that impossible (we could always push back your goal, that is, Return to Zork, if it seems you won't make it in time). The most difficult stretch is that between Spellbreaker and Stationfall. The former is long game in itself and then there would be six pretty big games before next Marathon game. If you can do that, rest should be pretty easy. So, here's what I'll do: I will commit to play all games through to 1985 and then re-evaluate. That gets us to Hitchhiker's Guide and I catch up to your play of Suspect. If I still feel happy and energized, I'll select a new target game, probably Trinity. And repeat. And, it is two things: some cool information about an unreleased Infocom game but also a rumination on the nature of game journalism and archeology. There are more than a few Infocom names in that comment train and frankly I'd be humbled if ONE of them ever commented on one of our posts. But it made me think. I don't usually aspire to high-journalism here, I just like to write about playing games and dig up what history I can while I'm at it. I have tried to contact a handful of authors (my interviews with David Marsh and Scott Adams are personal highlights), but I have no particular desire to be Jason Scott of "Get Lamp" fame (although I occasionally consider him a friend) or the "Digital Antiquarian". 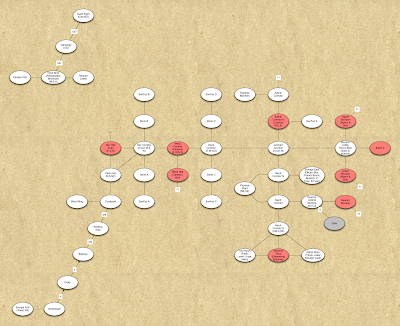 I hope that I never screw up any details in the history sections here, but I am sure that I do. Hell, I had Dave Lebling's name misspelled on a half-dozen posts! I started this journey not knowing much more about adventure games than that I liked to play them and have improved a bit since then. That Milliways prototype business was about the most underwhelming news I'd ever seen, far more noteworthy for the rogue's gallery it flushed out of retirement to scold the author than for the actual empty game shell. I'm not sure if I'm being influenced by all the Hitch Hiker's talk, but... 42! I remember vividly the beginning of Planetfall and the ending full of action, but of the central parts I have only faint memories (mostly Floyd). 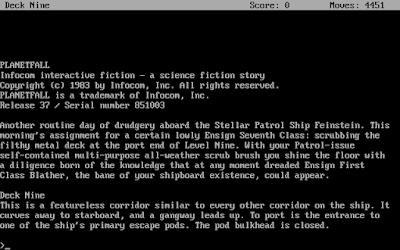 I do remember liking it more than Starcross, but not more than Zork 3. Let's say 40.